The war of words between Apple and Spotify has intensified after the former blocked a new version of the latter's new iPhone app. 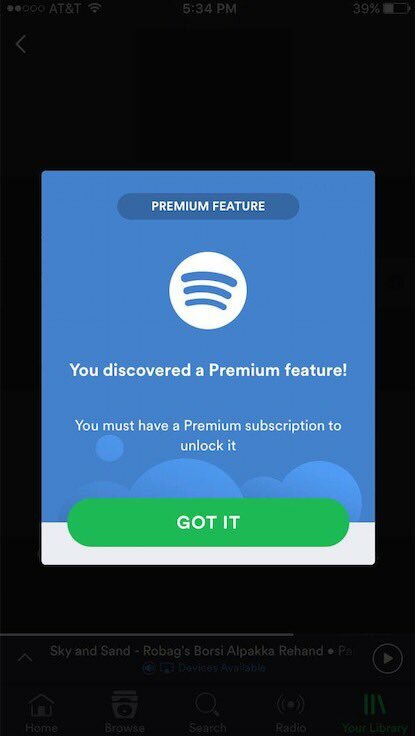 Apple cited “business model rules” in rejecting the app, demanding that Spotify use Apple’s billing system if “Spotify wants to use the app to acquire new customers and sell subscriptions" That's according to a letter to Apple general counsel Bruce Sewell by Spotify general counsel Horacio Gutierrez sent on June 26. Gutierrez wrote: "This latest episode raises serious concerns under both US and EU competition law. It continues a troubling pattern of behavior by Apple to exclude and diminish the competitiveness of Spotify on iOS and as a rival to Apple Music, particularly when seen against the backdrop of Apple’s previous anticompetitive conduct aimed at Spotify… we cannot stand by as Apple uses the App Store approval process as a weapon to harm competitors.” (Recode) However, Sewell responded in a letter of his own, telling Gutierrez: “We find it troubling that you are asking for exemptions to the rules we apply to all developers and are publicly resorting to rumors and half-truths about our service." (Buzzfeed) Spotify head of comms Jonathan Prince responded, tweeting: "This is what @Apple wants you to believe violates their rules. No offer, no purchase, no link to anywhere at all." Beyonce played two shows at Wembley Stadium while Massive Attack, Florence + The Machine and Carole King headlined the three nights of the opening weekend of British Summer Time Hyde Park. BST will host a series of free events in the park this week prior to the weekend's climactic three concerts featuring Mumford & Sons, Take That and Stevie Wonder. Wembley's concert season will resume and conclude with Billy Joel on September 10. Diana Ross for Glasto 2017 Legend slot? London-based festival package website Festicket has raised $6.3 million in a venture capital in a round led by Lepe Partners and existing investors pan-European VC firms Wellington Partners, PROfounders, and Playfair Capital. The platform offers an end-to-end experience for music travellers for more than 500 music festivals across 40 countries, and a network of 1,000 suppliers for accommodation and travel packages. The new capital will be deployed into operational and marketing resources to grow the Festicket live music fan community, supplier base and brand globally. The start-up previously raised $2.7m in September 2014 - following on from a $680,000 seed in 2013, which take’s its total funding to around $10 million. The July 4 edition of Music Week features analysis of breaking acts in the UK so far this year, ahead of this week's publication of Q2 figures. We also bring the inside track on Coldplay's tribute to Viola Beach at Glastonbury and the success of the BBC's coverage of the festival. We spoke to the indies about the Brexit fallout, while the Big Interview slot is taken by Insomniac's Pasqale Rotella, producer of Saturday's Electric Daisy Carnival UK.